Helping organizations manage lease accounting for 16+ years. PowerPlan has put together a library of best practices and resources your organization can use as you prepare for the monumental changes to lease accounting from GASB's Statement No. 87. While most have found that their existing lease management process cannot support the complexities of the standards, they still don't have their game plan ironed out for quick compliance. In this 30-minute recorded webinar, you’ll learn how others tackled adoption challenges that popped up along the way. Adoption Analysis: Use scenario analysis in the solution to analyze different adoption scenarios and determine your strategy for adopting the new lease accounting standards. Full Lease Lifecycle Management: Manage all capital and operating leases, including equipment, real estate and purchase power agreements. Automated Processes: Reduce audit risk by eliminating manual tasks, ensuring accurate billing, reporting and documentation. Time-saving solutions like integrated invoice creation with billing departments provides better traceability and recognition of receivables. Simplified Calculations: Automate the full range of lease calculations, from simplistic to the most complex, including variable rate and dynamic lease calculations. A Single, Integrated Solution: Seamless integration with multiple ERP, EAM and financial systems provides transparency into lease agreements, helping you make more strategic decisions. 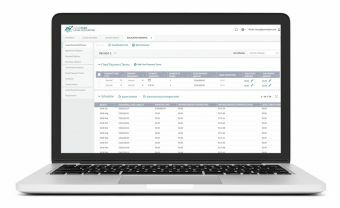 PowerPlan’s Lease Accounting Solution Suite helps companies determine their optimal adoption strategy for the FASB ASC 843 and GASB 87 lease accounting standards. The solution is also compatible with multiple accounting treatments, including GASB, GAAP and FERC.